That is lovely and impressive. I'm astonished they not only managed to slow the spin, but be vertical on landing. The rocket landed vertically and then continued with the normal post landing operations in horizontal mode. Venting the pressurized vessels for example. Pictures of the recovery process. The damage to the interstage (black part at the top) is quite significant. Otherwise, it appears to be in good shape, considering the circumstances. 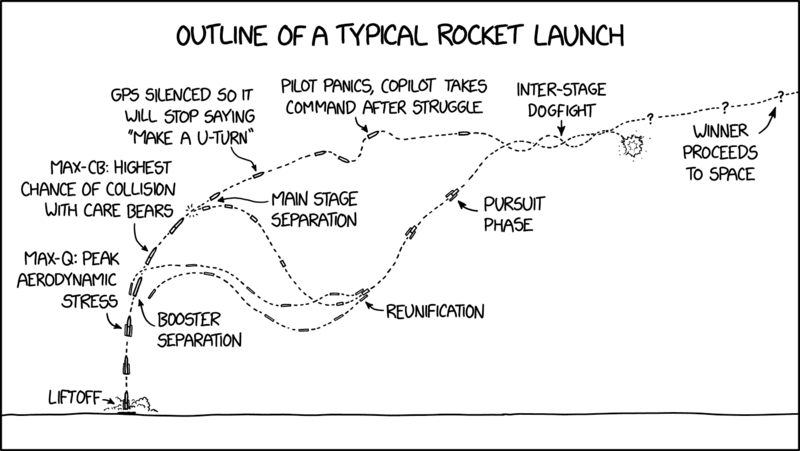 So XKCD has made a lovely outline of how a regular launch should go. NASA tries to coordinate launch timing with the Care Bears' cloud castle, but unfortunately sometimes collisions with stray Care Bears are unavoidable, so they just try to make the fairings sturdy and hope for a glancing impact. Dragon in space! Go SpaceX! Falcon Heavy Flight Two is scheduled for the 9th.